Regenerative Medicine Today welcomes Frank Witte, MD, PhD, Diego Mantovani, PhD, Prashant Kumta, PhD, and Charles Sfeir, MD, PhD. Dr. Witte is the Director of Biomaterial Research at the Laboratory for Biomechnics and Biomaterials, Hannover Medical School in Germany; Dr. Mantovani is the Director at the Laboratoire de biomatériaux et bioingénierie at the L’Université Laval in Canada; Dr. Kumta is the Edward R. Weidlein Chair in the Swanson School of Engineering at the University of Pittsburgh; and Dr. Sfeir is an Associate Professor in the Department of Oral Medicine and Pathology at the University of Pittsburgh. The group discusses their research in biodegradable metals and potential clinical applications. 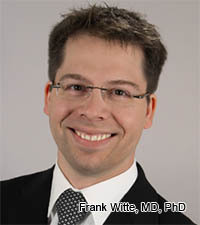 For more information about Dr. Witte, click here. For more information about Dr. Mantovani, click here. For more information about Dr. Kumta, click here. For more information about Dr. Sfeir, click here. For more information about the NSF Engineering Research Centers, click here. For more information about the Symposium on Biodegradable Metals, click here.